For the last four years of Billy’s hockey career (before we went to Germany) he was on two teams each year, and we lived in hotel rooms. You may be envisioning a lovely suite in a glamorous hotel…that wouldn’t be so bad. No, we lived in one regular room with two people…always together…sigh. Any hoo…during that time we ate all of our meals out. You’re thinking that doesn’t sound so bad either? It eventually gets to a point when all you can think is that ya just want is a bowl of Kraft Dinner, or PB & J, cuz you haven’t had one for months. I'm not saying that life was bad, on the contrary. We got to experience and love many great cities in both the U.S. and Canada! When we were in Duluth Georgia the Original Pancake House was near-by. We would go there for breakfast and in an effort to start the day out right we’d order oatmeal. The OPH (the home of giant, puffy omelets, and Dutch Baby pancakes) makes everything so delicious, even oatmeal. What makes their oatmeal so darned yummy is that they serve it with cream. 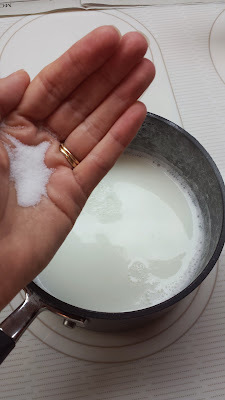 Real, thick and wonderful cream; just lovely! Cream is so yummy, but it’s indulgent. 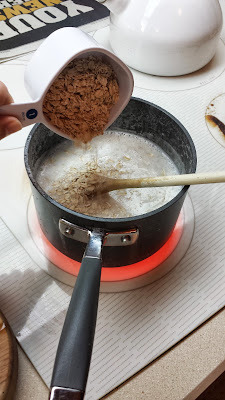 I find that by cooking oats in milk I can get that creamy flavor without adding the fat that cream adds. 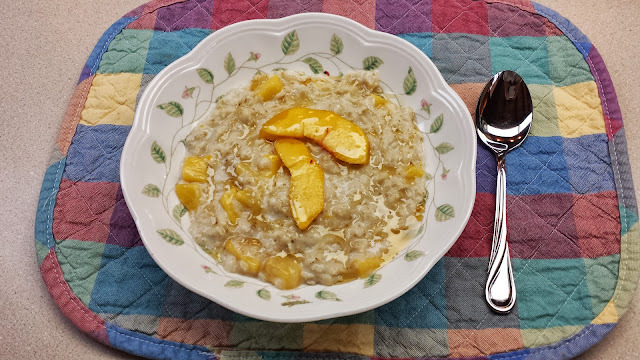 I had a big ol’ bowl of peaches sitting on the counter giving off the most amazing aroma and all that I kept thinking was that I needed to make Peaches & Cream Oatmeal. Weird right; of all the things I could make with peaches, I thought oatmeal? Well, I will never claim to be normal. Have you ever smelled peaches and cream? It may be one of the loveliest of smells on all of the earth. 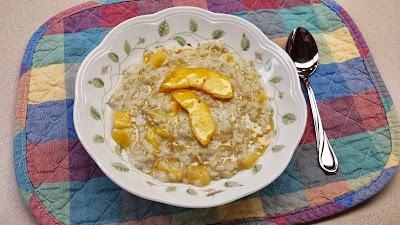 The smell that wafts through the kitchen as the oatmeal cooks with the peaches…aaah…It’s worth making Peaches & Cream Oatmeal just for the smell; but when you drizzle a little honey over the top and taste the creamy, sweet, peachiness…the taste is better than the smell. You just have to make it and find out for yourself! Start by bringing the water and milk to a low boil over medium-high heat. Have all your ingredients measured out so that this doesn't happen to you. Once the liquid comes to a low boil add a little salt. 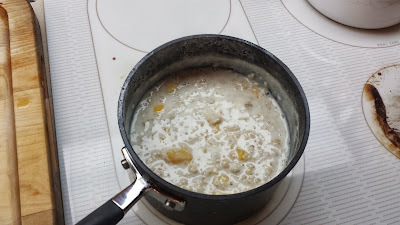 It's very important to add salt at this stage to any hot cereal or the cereal will be very bland. ...and half of the diced, fresh peaches. Cook while stirring occasionally for 5 minutes, and then add the remaining peaches. 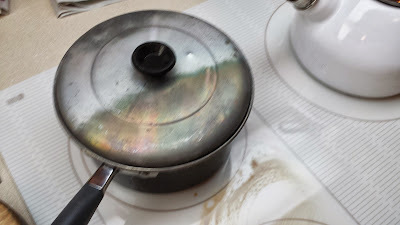 Remove the pan from the heat and put a lid on it! Allow this to sit for about 2 minutes. I served Peaches & Cream Oatmeal with just a drizzle of honey. You may wish to add more milk, or brown sugar instead of the honey...what ever floats your boat! 1. 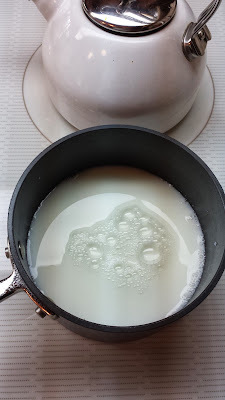 Add the water and milk to a 3 quart sauce pan. 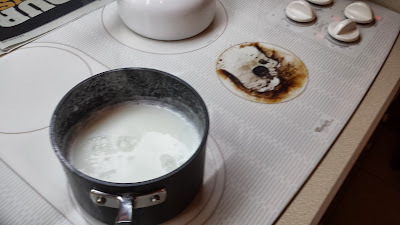 Heat over medium high heat, bring to a low boil; milk tends to boil over when heated so be sure to keep an eye on it. 2. 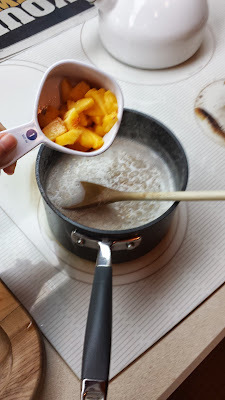 When the liquid is heated stir in the salt, oats and half of the diced peaches. When the liquid comes back to a boil, turn the heat to low and cook stirring occasionally for 5 minutes. 3. Stir in the remaining peaches. Remove the pan from the heat and put a lid on the pan and allow the oatmeal to sit for about 2 minutes. Serve with a drizzle of honey and more milk if desired. *Tip: For easier clean-up fill the pan immediately with cold water. Fresh peaches,oat and milk- that makes a wonderful breakfast! As tasty as prepared with cream but so much lighter. ANTHROPOLOGIE GIVEAWAY + SUMMER FUN! Watermark theme. Theme images by YinYang. Powered by Blogger.